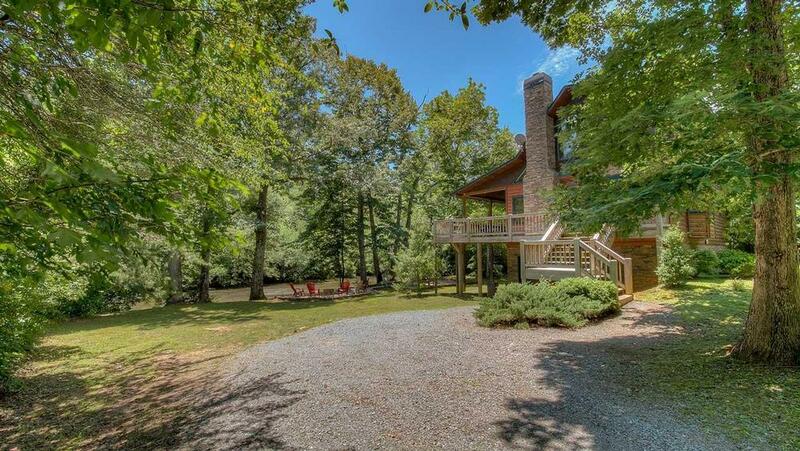 This gorgeous mountain home's riverfront location is the envy of many other Blue Ridge cabin rentals. 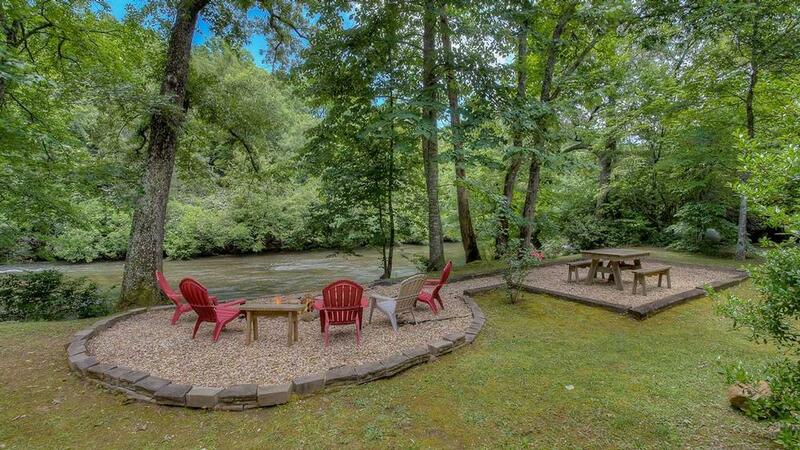 Sitting right on the shores of the Toccoa River, close to the Aska Adventure area in the beautiful Dial area, it offers easy access to fishing, tubing, kayaking and all of the great water sports you may seek out here in the North Georgia Mountains. Located just off of a main road, this is a lively, active location, particularly in summertime. Come on Inn and make yourself at home. In fact, that's the very reason this cabin was given its welcoming name. 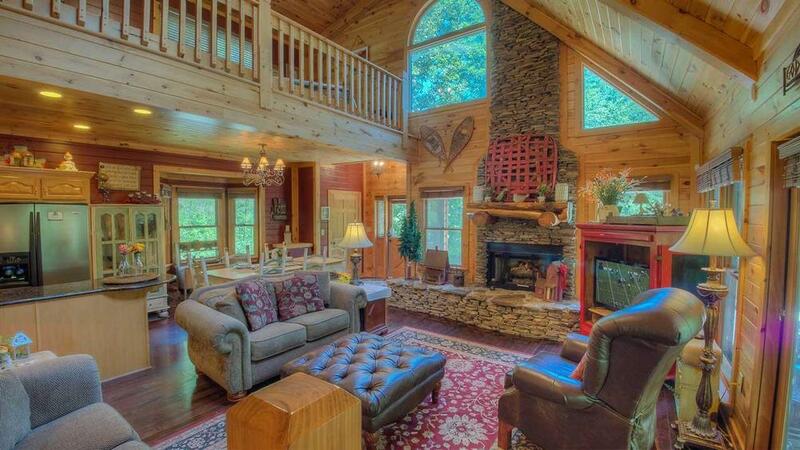 Its cozy environment will make you feel like this is your home away from home right away—The cabin's beautiful interior mixes mountain cabin dacor with charming country accents to create a unique and inviting atmosphere all its own. Walk in to the living room, sink into the plush sofas or supple leather armchair and put your feet up. Entertained by a book or a good movie, spend hours relaxing by the warmth of the floor-to-ceiling remote gas fireplace. 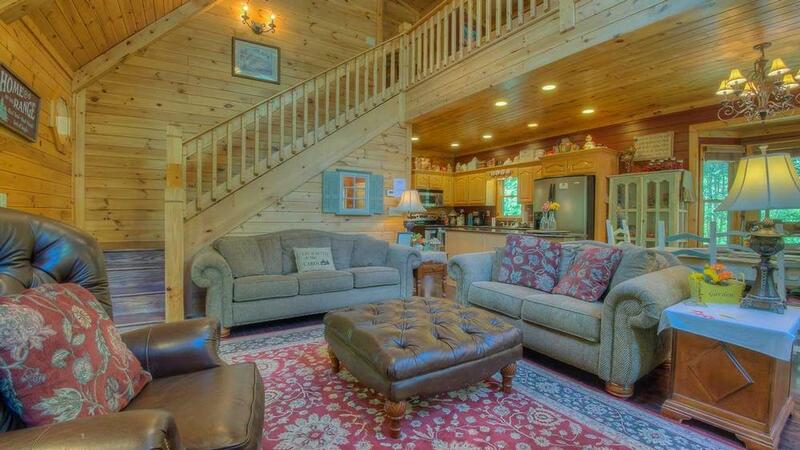 The cabin's outdoor living areas are equally enticing, so come on out. 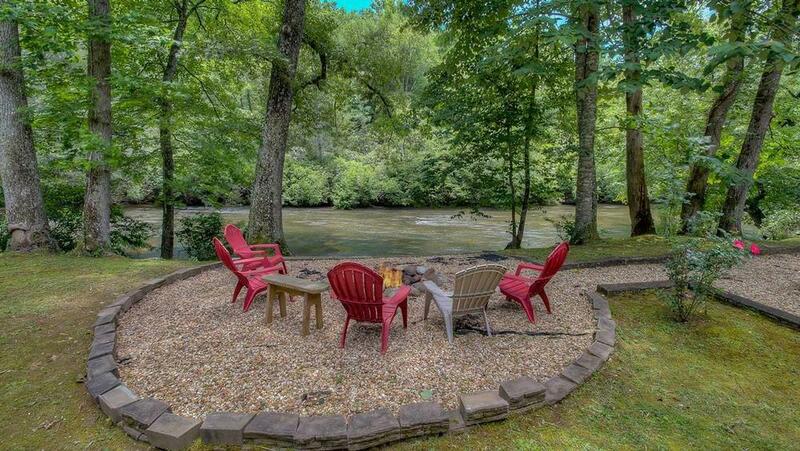 Spoiled by your location on the Toccoa, you may be tempted to spend all of your time outside — the fun never ends out here on the river! Set up lunch and snacks on the picnic table for easy access when you need a nibble during tubing or swimming breaks. You can also spend a lazy afternoon lounging on the porch swing, with the screened-in porch providing just the right amount of cool shade from the sunlight streaming in. As day turns into night, open a bottle of wine and fire up the grill for tasty barbecue ribs or perhaps some healthy veggie kabobs. Have dinner al fresco out on the picnic table or at the dining table on the deck. Then, two large king master bedroom suites will treat you to sweet dreams each night. Located on separate floors — one on the main floor, one upstairs — both bedrooms offer their own screened-in balconies for added privacy to enjoy quiet moments before bedtime or in the early morning hours. 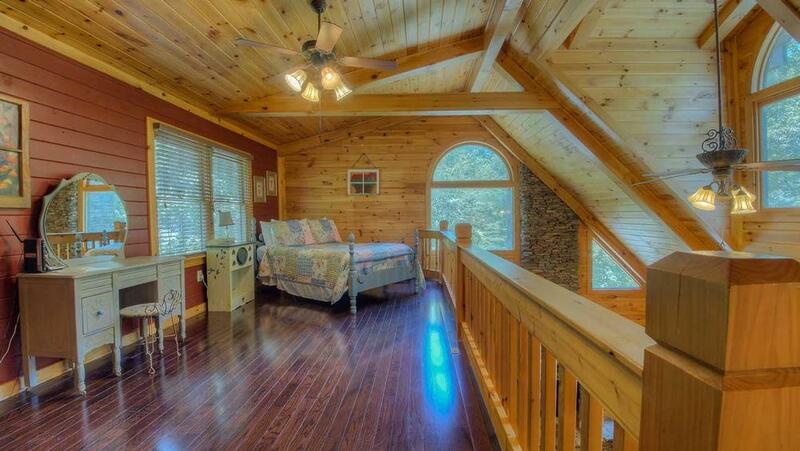 The loft area upstairs is also filled with its own country charm and a cozy full bed. Get ready for some fun in the sun and time spent relaxing and enjoying the great outdoors. The door's always open here and the water's great — so Come On Inn! 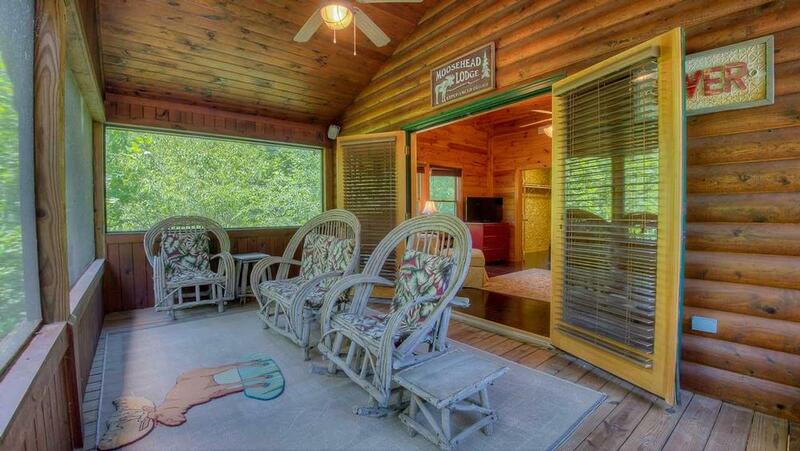 03/19 - Loved the set up of the cabin, especially the screened in porches! The staff is always very friendly and helpful. I will continue to patronize Escape to Blue Ridge and recommend them. 02/19 - EVERYTHING; LOCATION; CLEANLINESS; THE DECOR; AMBIANCE; EVERYTHING!!! 02/19 - The scenic view.....second to none. The company was very accommodating and courteous. 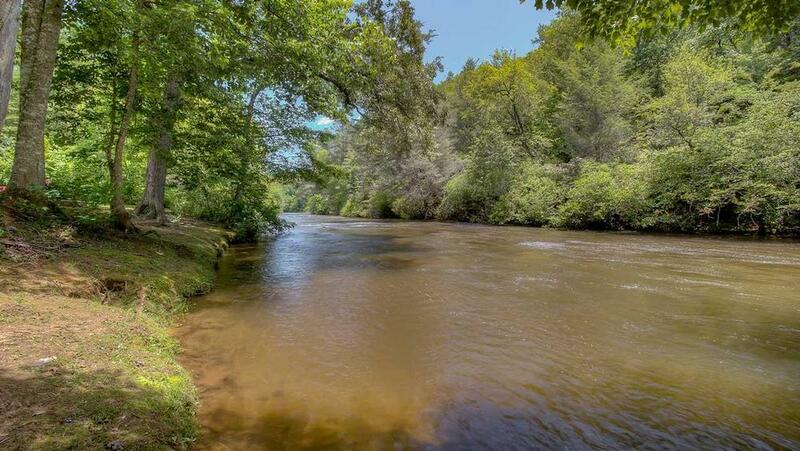 01/19 - Well-stocked kitchen, great pantry space, comfortable beds, screened porch and deck, soothing sounds of the Toccoa River, level yard area near the river. We have stayed in Escape to Blue Ridge properties a number of times now and have never been disappointed. Thank you for your attention to detail and commitment to excellence! We hope to rent again soon. 01/19 - Enjoyed the fire pit. Excellent, excellent company. 12/19 - Beautiful setting along the river. Cabin was very clean and perfect for our family of 5. Staff was excellent when booking and the cleaning staff had the cabin in perfect condition for arrival. 11/18 - Loved staying on the river, close to the Aska area and fishing. Very friendly and helpful staff. 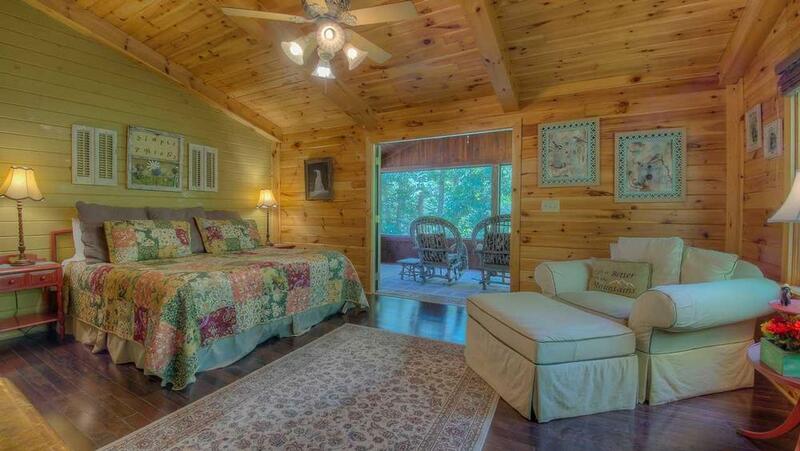 11/18 - We enjoy being on the river, the easy access, having two master bedrooms and the tasteful decor. I have been booking with Escape to Blue Ridge for years. The staff has always been pleasant and helpful. We look forward to coming back! 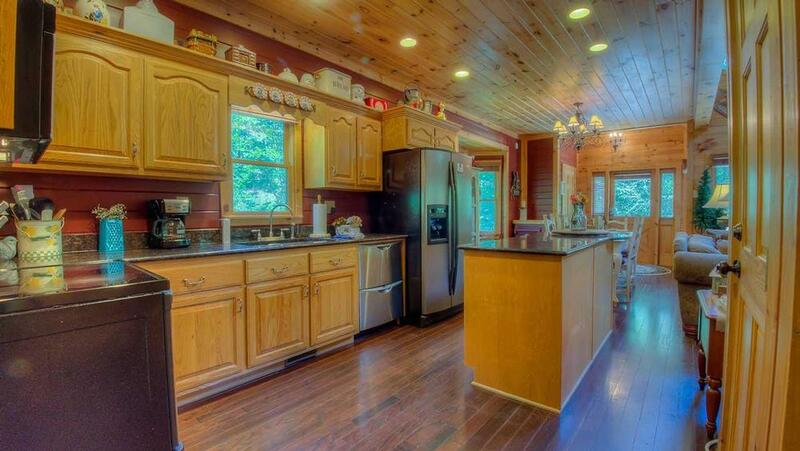 11/18 - The listing pictures showed a beautiful home in a great location. We were not disappointed. The house was clean, well equipped and very comfortable. Hope to visit again. This was our second booking with your company. Your customer service personnel have been courteous and very helpful. 10/18 - The cabin was great. Close to the river and close to the road. 09/18 - The Come On Inn cabin is very nice, clean, and decorated so cute and nice. Nice to work with and pleasant personnel. 09/18 - Peace, nature and comfort! Great customer Service and attention to detail! 08/18 - We loved being right on the lake and the large master bedrooms! We have used Escape to Blue Ridge more than five times and have already booked our fall trip next year with y’all. I appreciate how helpful and organized the company is and love the homes you have to offer. 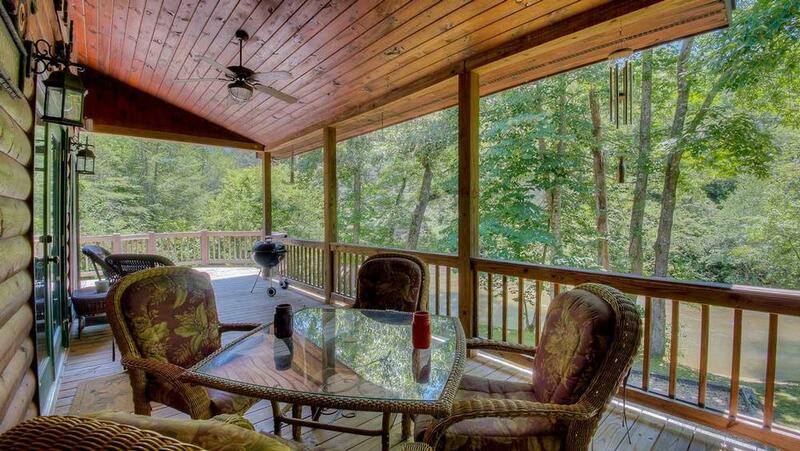 08/18 - The view, comfortable couches, great location, the firepit, kitchen had everything you needed. Very cozy. Easy and great to work with. 07/18 - Everything was lovely. Very professional company. 06/18 - The cabin was amazingly stocked! We had everything we needed. The binder of local activities was very detailed. 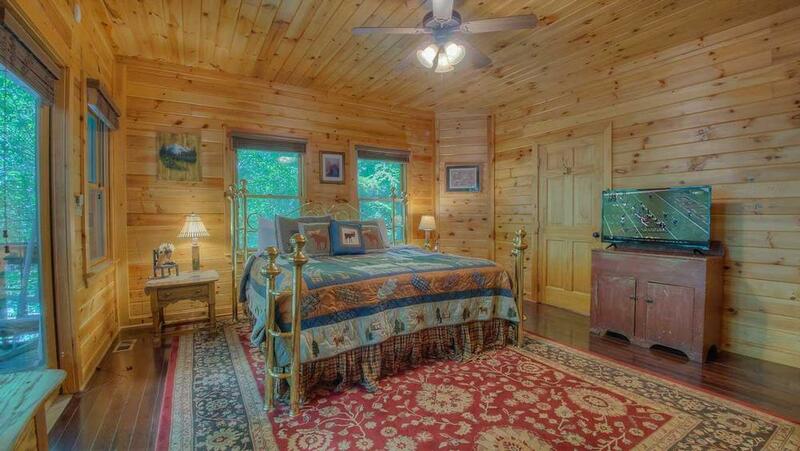 Gorgeous scenery, lovely interior, comfortable beds. It was fantastic. Your company was responsive, courteous, and well organized. You provided all the instructions and support needed to make this a wonderful vacation. Thank you. 09/17- I loved the location with the river in the back yard. The cabin was exceptional and also very clean. Exceptional in every way. The company was very helpful and very organized in every way before and up to our arrival. 08/17- I loved that it was on the river. Very attentive. 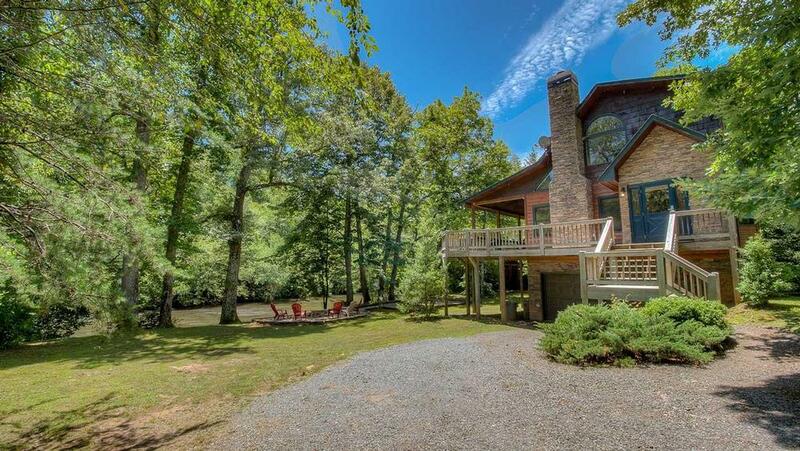 07/17- This house is located right on the Toccoa River. My adult children and grandchildren tube from the house to Sandy Bottom. Sitting and drinking coffee in the morning and listening to the river is mesmerizing. The house is beautifully decorated. We have had great success working with the company. Everyone is very helpful and courteous. 06/17- Most impressive were the river views from all the rooms. The beds were awesome! So impressed with the little touches like music playing when we arrived and the logs that were stacked and ready for a fire in the fire pit. We were very pleased with the friendly staff. They handled all our needs in a timely manner. 05/17- We loved the porches and all the outdoor space. The beds were very comfortable, and the living space great. I like calling, not facilitating online. We made our general choices with the info online, but once we called, we felt so much better. There is so much more info that you provided and I will definitely call next time. We will be back! 05/17- The cabin was beautiful, clean, and right on the river. Met all our expectations and more. The whole experience was wonderful, you got in touch quickly and were courteous and helpful. 05/17- We loved the screened in porch and being by the water. 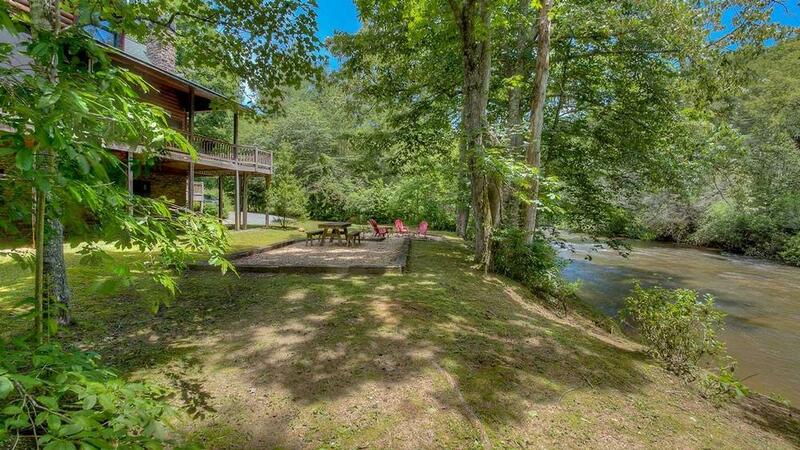 04/17- Our family really loved the location of this home, with the Toccoa River just steps away from the door (bring your fishing rods), and an easy drive to downtown Blue Ridge, Long Creek Falls, the Swinging Bridge, and so many other fun activities. The house is clean, very comfortable, and well equipped (appreciated the nice towels and bed linens). We had some cold, damp weather so really enjoyed the warmth of the fireplace. Your company was very easy to work with. All of the communication was pleasant, thorough, and clear. I look forward to working with ya'll again! 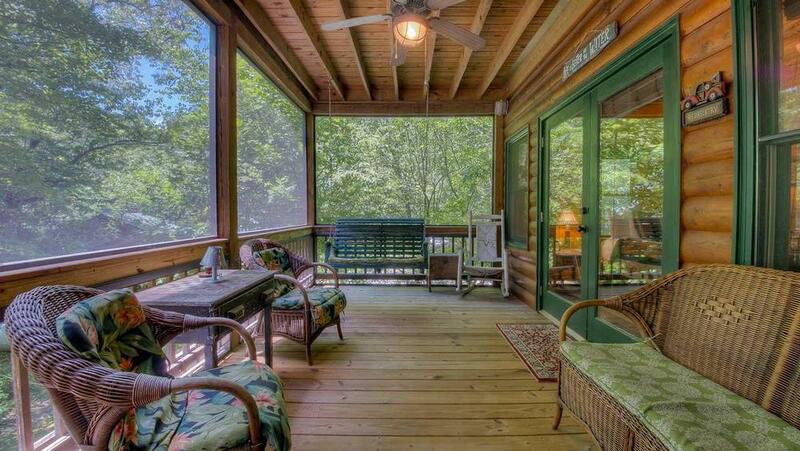 03/17- Favorite features were the view, screened porch and generous decks, peace and quiet. 02/17- This place was a home away for home. It was a great place that fulfilled all our needs and we loved the layout and the large rooms. I cooked most meals at the house. As a chef, I enjoyed cooking in the kitchen with its openness to the living room so I could enjoy my family as I produced our meals. The large porch was a big plus, as bad weather chased us inside at times. The company was quick and professional at all times and I look forward to using you on my next trip to the mountains. 01/17- I liked that the cabin is right on the river. We enjoyed the fireplace and the beds were very comfortable. The staff were very informative and nice. 12/16- The water was peaceful and beautiful. I have used Escape to Blue Ridge for several vacations & am VERY pleased with your website & with your staff. Pleasure working with you. 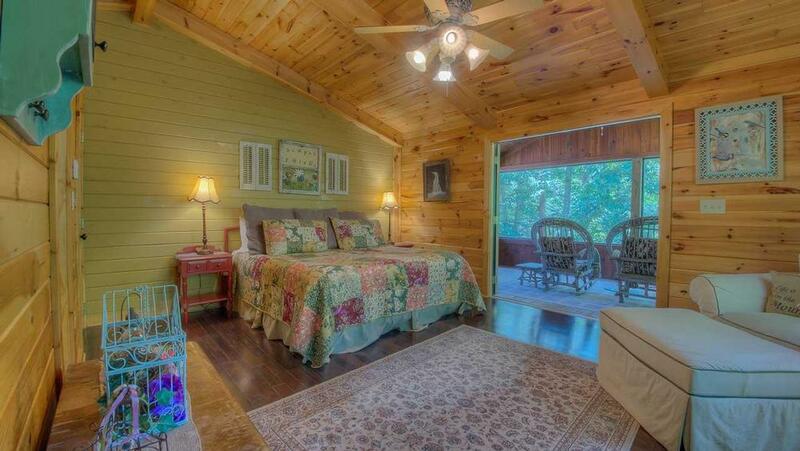 11/16- The cabin is beautifully decorated and the 2 bedrooms and bathrooms are ample size. 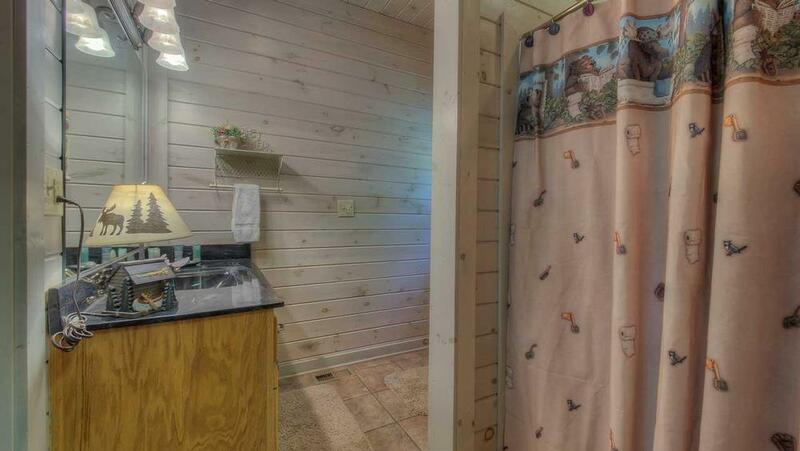 The upstairs bedroom has a large garden tub which was a nice addition to the shower. 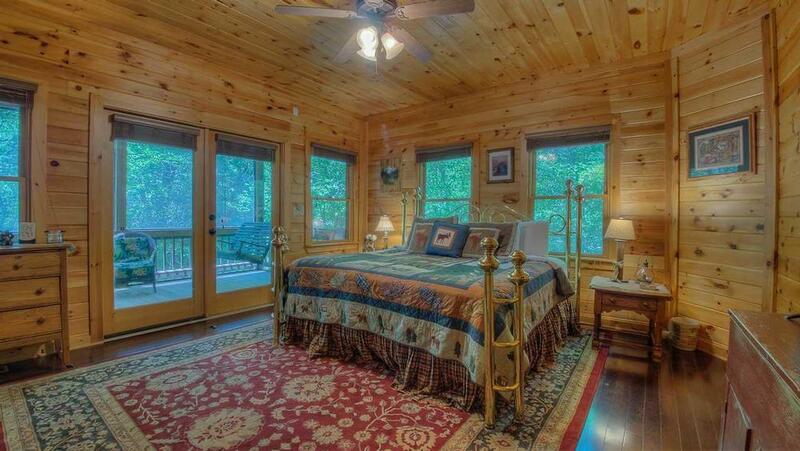 Each bedroom has a screened-in porch which is great for letting in the cool air in the evening without the bugs. There is seating on each porch and a large deck off the living room with table and chairs for additional outdoor eating. We loved the indoor fireplace and large kitchen table. The appliances are top of the line. The living room has a large flat screen TV which was great for watching football games. The couches are very comfortable. There is an outdoor fire pit by the water. 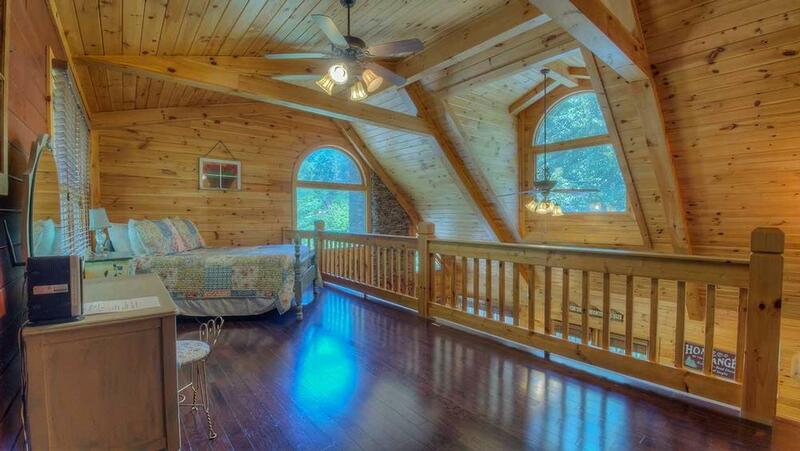 I would rent from Escape to Blue Ridge again. They have a wonderful selection of cabins. 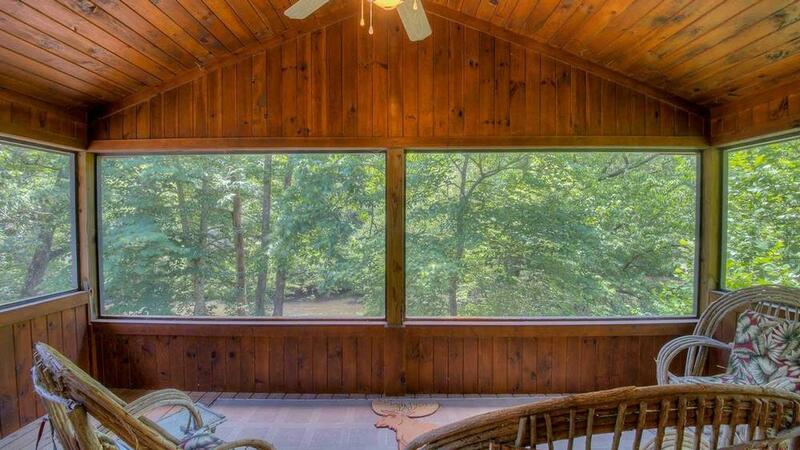 11/16- We loved the screened porches off the bedrooms. The company is easy to deal with. 11/16- The home was beautiful and very clean. Loved the river in the back yard. 10/16- Loved the river & porches & the location. It is so pretty! I'm very impressed with your company & hope to rent a cabin again next year. Everything is so organized & professionally done. We loved the cabin! It was decorated so cute! Again, thank you & I will recommend your rentals. 10/16- This cabin is right on the river so my girlfriends and I loved the sounds of the river. Very knowledgeable staff and easy to work with. 09/16- My favorite things about this cabin are the ease of access to the river, 2 master suites and the awesome deck overlooking the river. We have rented from Escape to Blue Ridge a couple of times and I would recommend y'all to others. 08/16- Love the back porch with river view. Better river access would be nice but not necessary. Comfortable bed. Guide book. Company very accommodating. 09/16- Loved the layout..very nice furniture indoors..great kitchen..absolutely LOVED the view. Excellent company! 08/16- The river and the porch were the places we enjoyed the most. It was like looking at a postcard. Customer service was great, you company was very attentive to our issues. We had yellow jackets, a toilet issue but Gabby and Sam stood out as model customer service employees and made our stay seamless. 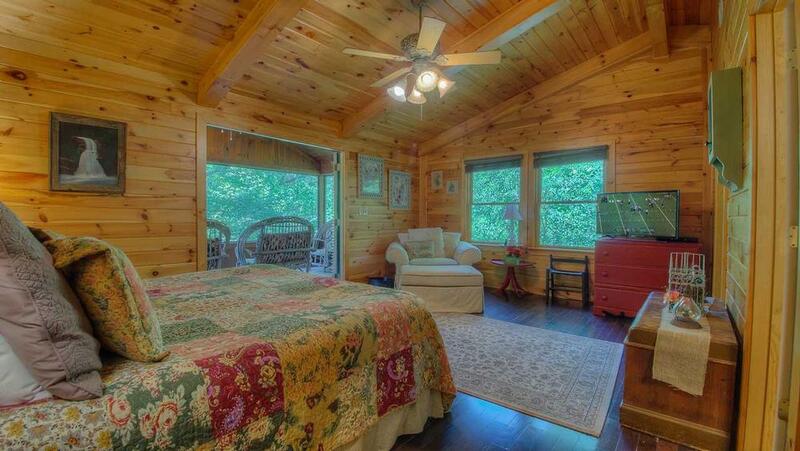 07/16- This cabin is located on the Toccoa River which is a real plus. Tastefully decorated and very comfortable. Every one at Escape to Blue Ridge are all very helpful and always so accommodating. Would definitely refer them. 07/16- This home is very well maintained and really nice. The river view in fabulous. Will recommend this cabin to All. 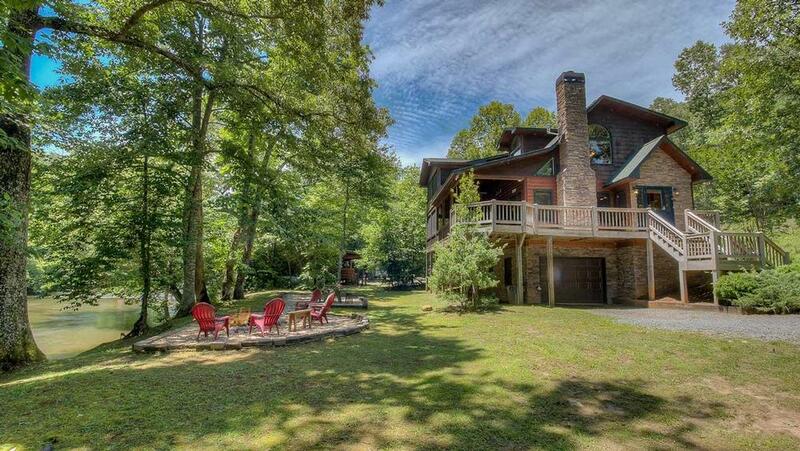 06/16- Right on the water and the open & closed porch with swing. Company is very helpful and easy to work with. 05/16- We were disappointed that it wasn\'t as clean as we would expect. It could have used more cleaning, especially the blankets. We had extra blankets in the closet but they were so dirty that we had to wash them before we could use them. The pads on the outside furniture were old and dirty. They need to be updated and kept clean. The outside table was dirty as well. There were only 3 chairs (plastic) by the fire pit and they were all broken. We had to bring the benches over to sit on. That was very disappointing. Not real comfortable. The house smelled musty, I would think that if you know guests are coming it would be opened up to air it out. Kitchen and bathrooms were clean. Overall we won\'t stay there again for the price we paid. Little disappointing. The pictures and details make it sound better than it is. 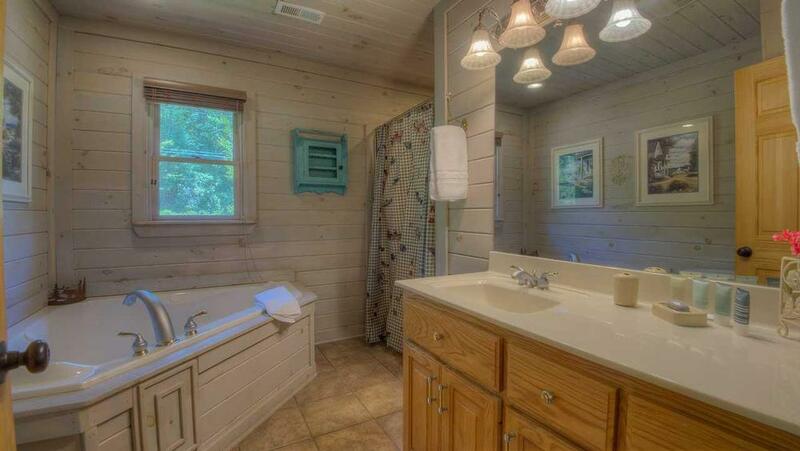 The price was higher, as we thought we would be getting a clean beautiful updated cabin. 05/16- The location on the Toccoa River was great and the beds were comfortable. 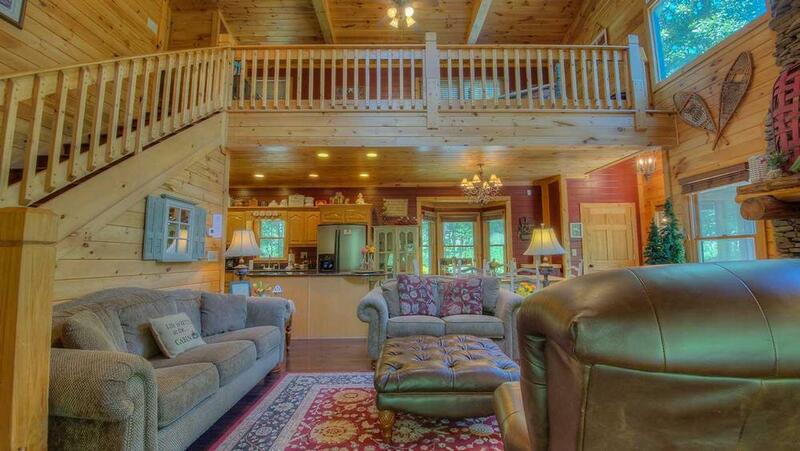 We have rented from Mountain Top Cabin Rentals for years and have always found their cabins to be impeccable. So this was our first experience arriving at a cabin that was not ready and needed a thorough cleaning. I have never written a negative review in the ten years we have been coming to Blue Ridge and renting cabins. And I don\'t like to focus on the negative but as a real estate agent myself I would want to know if a property I managed needed attention. 03/16- The cab in was very nice and comfortable . It was pleasant sitting on the porch listening to the river. 11/15- I really enjoyed the cabin being next to the river and having the fire pit there also. That' was the highlight of the trip. I only spoke to one person from the company and that was to book the Cabin and she was very helpful and extremely pleasant. 10/15- We loved the proximity to Toccoa River. Excellent! porch doors open and listen to the river day and night The office staff was very helpful. The home was suggested by a staff person after I said what I was looking for and it was exactly right. 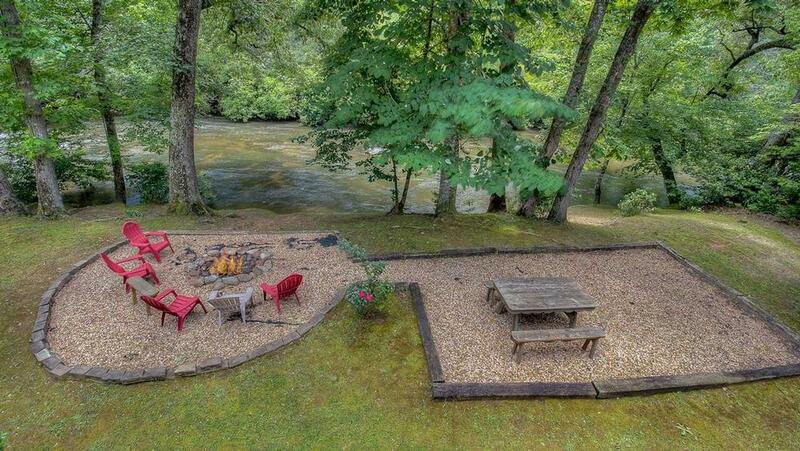 07/15- Lovely river bank, fire pit,and cook out area, in the back yard. The house was really comfortable and cute. Area activities were many and fun. Downtown was great. We went Rafting, tubing, to wineries, hiked trails to falls and swinging bridge, and went on the ghost tour. We love EBR. Have used them before and will use them again. Also , would like to be a cabin owner some day and will want to use EBR to manage a house for us. Houses are always what is advertised and then some. Staff always kind and helpful. Thank you all for a lovely trip again this year. 07/15- We loved the location of the home on the river. The furnishings were quite comfortable. The kitchen was well equipped and the beds were very comfortable. We really enjoyed ourselves. It felt almost like home. 07/15- The location on the river was wonderful. The house is beautiful and nicely decorated in an eclectic way. Loved working with the company. Quick response to any questions we had. Would definitely use again. 07/15- We loved how CLEAN it was!!! Very spacious, well appointed, ceiling fans, layout of house and loved that it was right on the water!! Very organized, polite - honestly this has become rare of companies now, which is sad. Everyone was amazing and we had an awesome stay at the house!!! 07/15- The house was beautiful and you couldn't find a better spot on the river. The company was great about bring us the things for the kitchen that the house was lacking. They also came out within an hour of us arriving there to take care of the yellow jackets nest under the porch that stung my husband as we went up the steps. 06/15- Loved the cabin. The layout was perfect for 2 or more if needed. Loved the filtered water in the refrigerator and ice maker was nice. Access to the river was great. 05/15- location to the river was great! I think you have a nice company to deal with. 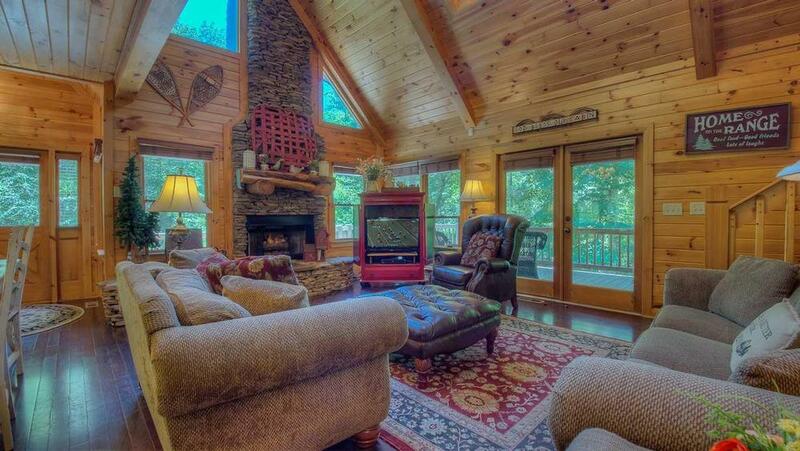 04/15- We really enjoyed the beautiful cabin and the setting w/the river and fire pit out back. 09/14- comfortable sofas and beds.river.fire pit by river. Nice clean cabin by a nice river.enjoyed the stay and look forward to coming back to Come On Inn. 09/14- Main level living area was very nice and comfortable. The house sits on the Toccoa River so the atmosphere on the decks was very relaxing! 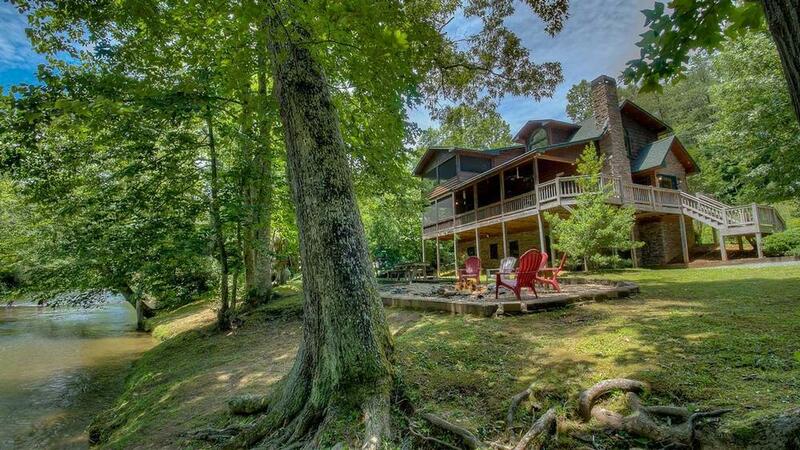 I have rented 8-10 cabins from Escape to Blue Ridge over the last 4-5 years and have enjoyed all of them but have never rented the same cabin twice. However, I will definitely rent this one again. 09/14- The large comfortable beds, fabulous screened porches off each bedroom, that amazingly well-situated deck where we could watch the river stream by and sit in the sun or shade. 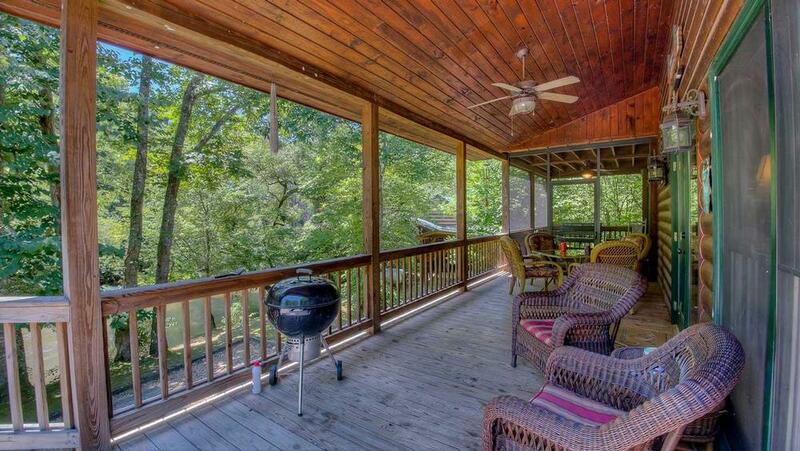 05/16- Open space, porches and river.